Spotify is proving incredibly successful, and since December its users have clocked up over 13 million hours of music listening around the world. 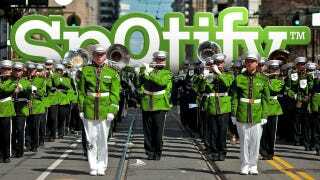 But it has its sights set higher; it wants to take over the digital music ecosystem entirely. The Guardian reports that Spotify's rise has brought with it a rash of third-party developments: play list generators, lyrics wikis, and custom radio services to name a few. It's products like these which Spotify is hoping to capitalize upon. "Everyone has their individual idea for what Spotify should do next, which is why we love music apps. They are important so we can cater to all those needs. And since people are asking us to provide these features, when we do, music will be more valuable to them. They will be more likely to pay..."
Its plan, then, is to turn itself from an app, into a platform. "We have to turn ourselves into the OS of music," says Garmark. In doing so, it seems to be taking a leaf out of Apple's book. "It's a curated platform: we want to make sure the content is great, so we're not just letting anyone release anything. We're working with them to make sure it's good. We don't want our users to have crappy experiences with apps."